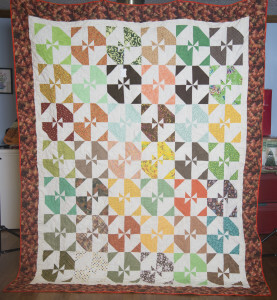 If you look carefully at each block there is a small pinwheel at the center of each block. It also has beautiful Fall colors. It is a queen size quilt and measures 104″ X 85″. Because of the way each block was cut, the pinwheel in the center was able to be formed. The cost of the quilt is $650.